Both emotionally and physically scarred from an accident, Zoe Flannigan must take a journey to meet Paul Johansson—and to discover a love as beautiful and boundless as the wide Montana sky. High school principal Paul Johansson has never been lucky in love, which is too bad, because few men in Montana are more naturally romantic. Then his friend Maggie signs him up for Internet dating, and while Paul is initially furious, he’s soon blown away by Holly Morgan, a blonde, blue-eyed art teacher from Connecticut. She might just be the girl of his dreams. Zoe Flannigan—aka Holly Morgan—totally forgot about the account she set up two years ago on Meet-the-One.com. In fact, after an accident that left her physically and emotionally scarred, she hasn’t been up for meeting or dating anyone. Until Paul. Handsome, sweet, and too-good-to-be-true... But while the built-in anonymity of the Internet offers a buffer, she can’t hide in cyberspace forever, either from Paul’s expectations or from herself. There’s a journey she must take, and at the end of it will be a love as beautiful and boundless as the wide Montana sky. Zoe didn’t realize she’d been holding her breath until it came out in a rush. Her heart pounded in her chest as she turned over the phone. How could something as impersonal as an e-mail be so affecting? Her lips turned up in a slight smile as she savored the warmth and sincerity of his words. She was not surprised – Maggie had been so effusive, there was no way Paul was going to be another jerk – but, she was unprepared for the impact of reading his e-mail. She had assumed the physical distance between them would make him feel far away. Instead, it was like she’d just spent ten intimate minutes inside his head. She sat back in the chair and let her damaged face bathe in the warmth of the sun for a moment as he had suggested, even though she knew it wasn’t a good idea. Until her final surgery in early October, it wasn’t smart to discolor the puckered, violet skin any further. She thought about the girl in the photo that Paul must have finally seen last night. It had been taken three years ago at Sandy and Rob’s wedding even though Zoe knew it would have been far more honest to upload a recent picture of herself. In fact, she’d found a photo taken in the past few months – she wasn’t smiling, but at least it was in profile and didn’t show her bad side – but when she’d held the newer photo up to her computer screen, staring at the two incredibly different girls that were both Zoe, she couldn’t bear to do it. Swap out the photo of the trim, blond, sunny girl who used to be Zoe? For the heavier, black haired, dark eyed, tattooed, scarred disaster she’d become? Right. She’d never hear from him again, and for whatever reason, it really mattered to Zoe that she hear from him again. She sighed. She knew she should delete Paul’s message, disable her account and leave him alone. He was a nice guy looking for love and she had no right to lead him on even the littlest bit. Yet when she visualized deleting his sweet e-mail and disabling her Meet-the-One account, a terrible heaviness threatened to edge in on the little bit of light she’d been enjoying. Was exchanging a few e-mails really leading him on? It was more like being pen pals, especially if she was upfront about her intentions to be friends. 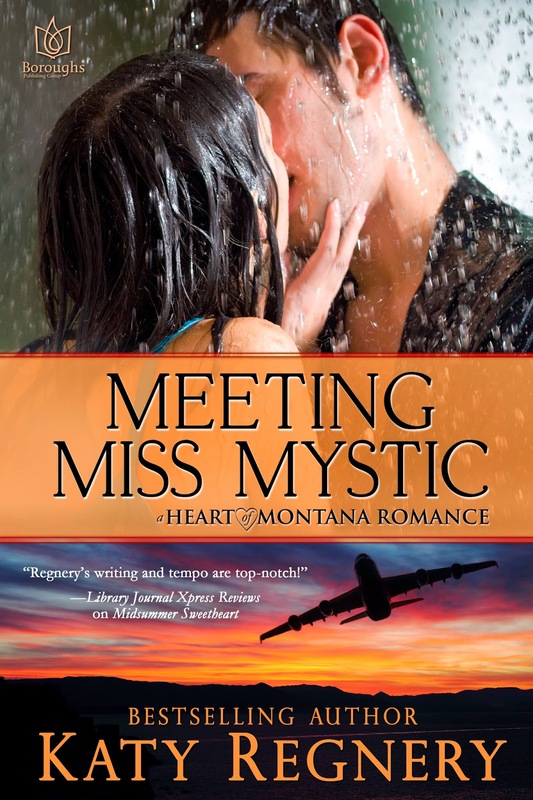 She could tell him about her life in Connecticut and he could tell her about Montana and Yellowstone – get to know each other, just as he suggested. No more, no less. They couldn’t very well get romantic from so far away, could they? No, of course not. His e-mail only felt intimate because it had been so long since a man – a nice, decent man – had been so kind to her. It was impossible to be intimate from two thousand miles away. There was no reason to overthink it. Halfway convinced that she wasn’t a horrible person for writing back and ignoring the guilt that wouldn’t quite leave her alone, Zoe picked up her phone and pressed reply. KATY REGNERY, Amazon best-selling author, has always loved telling a good story, and credits her mother with making funny, heartwarming tales come alive throughout her childhood. A lifelong devotee of all romance writing, from Edwardian to present-day, it was just a matter of time before Katy tried her hand at writing a love story of her own. As it turned out, one love story turned into a series of six Heart of Montana romances, following the love lives of the Yellowstone-based Lindstrom siblings. When Katy's fans asked her to turn up the heat, she cheerfully started her Enchanted Places series, which offered steamier romance to her readers. Katy was also proud to offer a stand-alone romance, The Vixen and the Vet, written as a benefit for Operation Mend, just in time for Fourth of July, 2014. Katy hosts a #LunchtimeLiveWithKaty party every day from 12:00-1:00pm EST. Visit Katy at: www.katyregnery.com, www.facebook.com/KatyRegnery or @KatyRegnery on Twitter - she loves to hear from her fans!